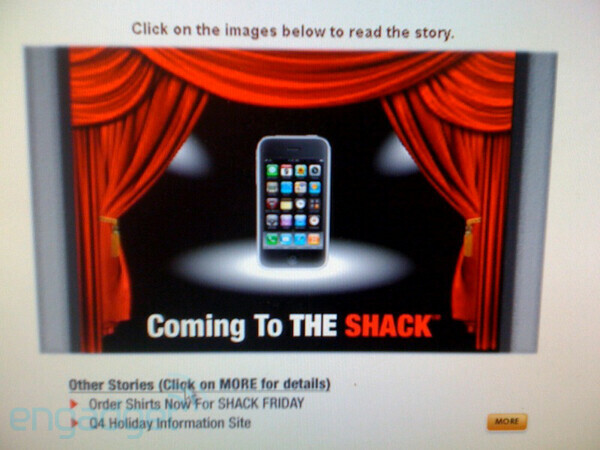 Love Shack: iPhone coming to Dallas and NYC Shacks this month, all U.S. next year? With some AT&T authorized resellers being allowed to offer the iPhone, it might come as no surprise that Apple's touchscreen device is going to Shack up starting with the Dallas and NYC stores. A tipster turned over to Engadget Mobile a picture of a letter that was supposedly written by Executive VP of store operations, Bryan Bevin. 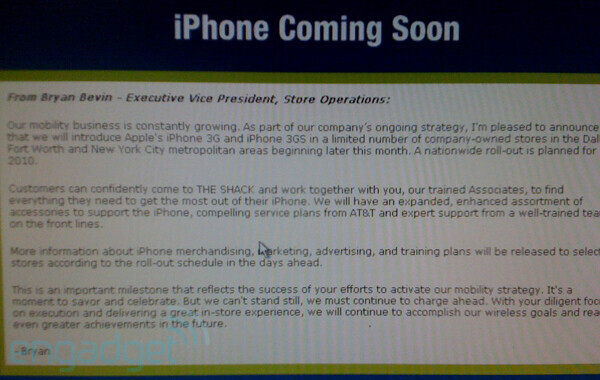 According to the document, some company owned locations in the Dallas Ft. Worth and NYC areas will be getting the iPhone 3G and 3GS to sell starting sometime this month. A nationwide rollout is expected sometime next year. So when you need to pick up those hard to find cables and diodes, you'll be able to add an iPhone to your purchase as well.